"Simple, practical, and powerful lessons on the importance of attitude, responsibility, and choice in shaping our lives." "Dan Johnston manages to simplify his wisdom in such a way that change and recovery seem possible and rewarding. Bravo!" ~ W. Douglas Skelton, M.D., Senior Vice President for Health Affairs, Mercer University. ~ Fr. Dan Edwards, Co-director of Omega Point, Author of A Study Guide to Prayer Book Spirituality. ~ Oby Brown, Features Editor, The Macon Telegraph. ~ Don Faulk, President, CEO, Central Georgia Health Systems. "Lessons for Living offers wide-ranging, practical advice that highlights the importance of attitude and action in meeting the challenges of daily life." ~ Perry Buffington, Ph.D., Author of Cheap Psychological Tricks. "Dan offers encouragement for a fuller life through brief lessons. You will want to read it cover-to-cover, and then return to particular lessons, as situations arise, for daily reflection and/or to share with others." 70 brief Lessons providing common sense solutions to life's problems. Buy the soft cover book from Amazon.com by Clicking Here! Now available with a 60% discount for only $6.00 as an instant download ebook. This is in an Adobe PDF format and can be read on any computer with the free Adobe Reader. Click below to buy the e-book. 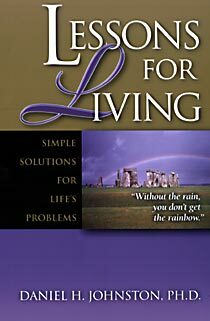 Lessons for Living: Simple Solutions to Life's Problems is a self-help book with practical advice on what to do to make life go better. Each short, easy-to-read chapter has common sense information to help you change your life. Undoing what stress does to you. Worrying less and enjoying life more. Bouncing back from life's ups and downs. Learn about Employee Resiliency Training with "Lessons for Living"
If you enjoy the Awakenings Web Site, you will love this book. It contains some of our most popular lessons along with many new ones. Available on-line and in bookstores everywhere. Makes a great gift. Daniel H. Johnston, Ph.D. is a clinical psychologist and former Director of Psychological Services at the Medical Center of Central Georgia in Macon, Georgia. He currently serves on the faculty of the Mercer University School of Medicine. Over the past twenty-five years Dr. Johnston has taught self-help skills to thousands of people in settings ranging from hospitals and clinics to community groups and churches. He is a frequent guest on local television and had his own weekly show on 13WMAZ in Macon, Georgia. Dr. Johnston has developed the popular Awakenings Web site and offers information on psychological health to tens of thousands of worldwide visitors each year. He is a former columnist for the Macon Telegraph newspaper.